It was the Greek philosopher Heraclitus who said: “No man ever steps in the same river twice, for it’s not the same river and he’s not the same man.” He was referring to the fact that change is constant. It could be said that no dentist carries out the same procedure twice because each clinical situation is different and that, by definition, each procedure adds to the experience of the clinician and therefore s/he is not the same dentist. It requires self-awareness, critical analysis, synthesis and evaluation, and helps gain new insights into self and practice. It’s been likened to a spiritual process – connecting the inner self with the outer world. Studies have shown that reflective practices are connected to outcomes, so the principle is beyond the theoretical. From a risk management perspective, both are of equal value but in very different ways. Reflection-in-action provides opportunities for corrective actions and may prevent error and harm to the patient. It is usually intuitive. 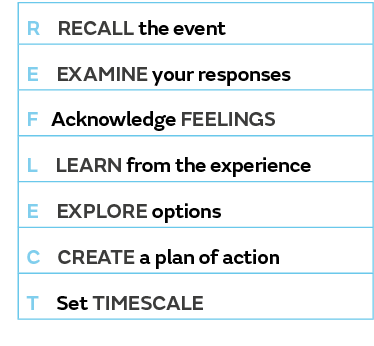 Reflection-on-action is retrospective. It takes place sometime after the situation has occurred. It requires protected time and commitment. Schön emphasises its importance “to discover how our knowing-in-action may have contributed to an unexpected outcome”. For this reason, reflective capacity is regarded as an essential element of professional competence. It integrates theory and practice from the outset. 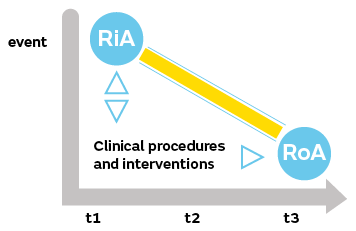 The risk management lessons derive from the ‘reflection corridor’ (figure 1, yellow highlighted zone) that encompasses the totality of the process over a timeline – where t1-t2 demarcates reflection-in-action from reflection-on-action at t3. Reflection-in-action should be a continuous process. It informs the procedure and vice versa, so that real-time modifications and actions can be taken to ensure optimal outcomes for the patient. Demonstrating reflection is essential for dentists appearing before the GDC. It demonstrates insight into the concerns under investigation and can impact the outcome. It is an integral part of our preparation in GDC cases to support members over and above the dentolegal aspects alone. Activities to promote reflection are now being incorporated into undergraduate and postgraduate education across a variety of healthcare professions. For example, reflection is a requirement in the professional development portfolio during the foundation training year, and we encourage it after any unexpected incident or adverse outcome. It can also inform the content of a complaint response. Adjust your personal development plan as needed. Reflective practice promotes changes in our thinking and our approach to the delivery of clinical care, which is also influenced by legislation, regulation, new technologies and innovative treatment modalities. The focus must be on feedback and actions – going beyond the simple descriptive narrative of what happened and why these actions must lead to change – to realise the full value of the process. By adopting this approach, risk management becomes an integral part of experiential learning and not an afterthought. Schön, D. The Reﬂective Practitioner: How Professionals Think in Action., New York: Basic Books, Inc; 1983. General Dental Council. Enhanced CPD guidance. Available from: https://www.gdc-uk.org/professionals/cpd/enhanced-cpd. Barksby J, Butcher N,.Whysall A. A new model of reflection for clinical practice, Nursing Times 2015; 111:(34/35): 34–35.